The Royal Air Force Mountain Rescue Service was officially formed today. This unit will be responsible for teams of mountaineers to undertake rescues of aircrew and the general public in danger, or injured, in mountains and high hills throughout Britain in all types of severe weather. The RAF has been undertaking such work for several years and the Air Staff have decided that a specialised unit is required. A world tour has left Britain today to promote the Empire Exhibition at Wembley which will officially open on 10 June. A group of eminent British artistic and cultural figures will make a world tour by air flown by BOAC. They left for Bermuda from Southampton via flying boat at 10am today. From Portsmouth, the pride of the Royal Navy, HMS Hood set sail with the Prince of Wales and several political, industrial and government figures aboard as well a series of travelling exhibitions. The ship will be open for public inspection during the tour. Today the 6th Destroyer Flotilla at Gibraltar disbanded and its ships, HMS Westminster, Whirlwind, Winchelsea, Winchester, Windsor, Wolverine, Wessex and Wild Swan decommissioned for disposal. Their place has been taken by the 25th Destroyer Flotilla transferred from Singapore. Today there has been a serious rail crash at Ilford, Essex in which nine people, one of them Frank Heilgers, the Member of Parliament for Bury St Edmunds, were killed. Due to bad visibility in foggy conditions the driver of the 2.38pm express passenger train from Yarmouth had not seen several caution signals and had subsequently stopped 110 yards past the danger signal. The driver walked to signal box and was given a "line clear" signal by the signalman. As the driver returned the signalman had a telephone call from the signalman in the adjacent box reporting that the following train, the 2.40pm express passenger train from Norwich to London Liverpool Street, had passed all his danger signals. The Ilford Station Inspector attempted to place warning detonators at the rear of the Yarmouth train but was unable to reach the rear of the train before, at about 6:20pm, the Norwich train collided with the rear of the Yarmouth train on the up line at Ilford station at a speed of about 20mph. There were nine fatalities, twenty-eight people were taken to hospital and ten other passengers suffered shock or minor injury. Hampered by the dark and fog the last of the casualties were not recovered until 9:20pm. The Foreign Office has pledged to send aid to the earthquake stricken area of San Juan in Argentina. It is thought supplies of food and medical aid will be shipped via sea. Attempts to fly smaller quantities of urgently needed items are being investigated. The Director of British South American Airways, the record-breaking former Imperial Airways pilot Donald Bennett had several crews around his desk and the cargo despatchers and maintenance chief. He spread the maps and load charts across his desk. "We've a job to do lads. I'm sure you've heard the news about the earthquake and we need to fly urgently needed supplies to Argentina. I've just had the Foreign Office on the phone, they are trying to get Treasury authority to purchase aid supplies locally. We'll have to fly across the Atlantic via Alantis on the normal route, pick the supplies up from Jamaica and fly them south. We're waiting on the official clearances along the flight plan. Steve, we've got the two Tudor freighters and I want six Yorks stripped of the seats and your team will have to devise some kind of lashing system using the seat rail points. I want them ready to fly a shuttle to Blighty and back and to fly to Argentina within three days. Now let's examine these flight plans..."
The Bristol Vickers Aircraft Company (BCAC) has sent their prototype and their sales demonstrator Type 170 Freighters to Argentina to help in the rescue efforts. Through their nose doors at truckbed height they can load bulky cargo of all types and deliver them to rough strips with the minimum of field support. Today what the press has dubbed the Great Colony Swap officially takes place. In return for turning the Mandate of Togoland and the shared rights in Vanuatu to France, Britain will gain control of the former French colony Chad. The Colonial Secretary William Ormsby-Gore was in Ndjamena for the official ceremony and the British delegation then toured the city. British officials have ready for some days to begin their official duties and there remains much to do and much work to fully make Chad a fully integrated part of the Empire. A yearly round-up of the cultural highlights of the year. The newest gallery in Britain is the Swindon Art Gallery in Swindon, Wiltshire. It includes one of the best collections of 20th-century British art outside London. The collection was established by a local benefactor, H.J.P. Bomford, through a significant donation of artworks. Artists in the collection include Ben Nicholson, Henry Moore, Graham Sutherland, L S Lowry, Paul Nash, Steven Pippin, Terry Frost, Howard Hodgkin, Gwen John, Augustus John, Maggi Hambling, Ivon Hitchens, Christopher le Brun, Lisa Milroy, David Leach, Lucie Rie and Hans Coper. The art includes paintings, photography and studio pottery. Francis Bacons painting Three Studies for Figures at the Base of a Crucifixion, William Coldstreams painting Hospital, Capua and Dame Laura Knights unusual realist paining of an airliner interior, Take Off. Jacob Epstein has completed two sculptures this year, First Portrait of Esther (with long hair) and Lucifer. H. E. Bates' novel Fair Stood the Wind for France. The story concerns John Franklin, the pilot of a Sopwith Camel who badly injures his arm when he is shot down on the wrong side of no-mans land in France at the height of the Great War. He makes his way to an isolated farmhouse and is taken in by the family of a French farmer. Plans are made to smuggle him across the lines but Franklin's condition worsens and he remains at the farm during the hot summer weeks that follow and falls in love with the farmer's daughter Françoise. Eventually they make the hazardous journey together by rowing boat and bicycle. Joyce Carey's novel The Horse's Mouth is the third in his First Trilogy, whose first two books are Herself Surprised (1941) and To Be A Pilgrim (1942). The Horse's Mouth follows the adventures of Gulley Jimson, an artist who would exploit his friends and acquaintances to earn a quid, as told from his point of view. Cary's novel also uses Gully's unique perspective to comment on current social and political events. Agatha Christie's has published two novels this year; Towards Zero which is the last book to feature her recurring character, Superintendent Battle, and Death Comes as the End which is Christies only novel not to be set in the 20th century and without European characters. The novel is set in Thebes in 2000 BC, a setting for which Christie gained an appreciation of while working with her archaeologist husband, Sir Max Mallowan in the Middle East. The novel is notable for its very high number of deaths and is based on real letters, translated by egyptologist Battiscombe Gunn, from the Egyptian Middle Kingdom period from a man called Heqanakhte to his family, complaining about their behaviour and treatment of his concubine. L. P. Hartley's new novel The Shrimp and the Anemone is the first in a planned Eustace and Hilda trilogy. W. Somerset Maughams novel The Razor's Edge tells the story of Larry Darrell, a pilot traumatized by his experiences in the Great War, who sets off in search of some transcendent meaning in his life. The story begins through the eyes of Larrys friends and acquaintances as they witness his personality change after the war. His rejection of conventional life and search for meaningful experience allows him to thrive while the more materialistic characters suffer reversals of fortune. L. T. C. Rolt's book Narrow Boat is a about life on the English canals. It describes a four month trip that Rolt took with his bride Angela in the summer of 1939. G. M. Trevelyan's book English Social History is a survey of six centuries from Chaucer to Queen Victoria. Notable Welsh books this year include; Rhys Davies Black Venus, Thomas Rowland Hughes William Jones, Edward Morgan Humphreys Ceulan y Llyn Du, Jack Jones The Man David , Alun Lewis The Last Inspection, Sir Percy Emerson Watkins A Welshman Remembers and Sir Ifor Williams Lectures on early Welsh Poetry. The most notable British film of 1944 is the first-ever Shakespeare film adaptation in colour, Henry V. It stars Laurence Olivier, who also directed the film. The play was adapted for the screen by Olivier, Dallas Bower, and Alan Dent. The score is by William Walton. The film begins as a recreation of a stage production of the play in the Globe Theatre, and then gradually turns into a stylized cinematic rendition of the play, with sets reminiscent of a medieval Book of Hours. It follows the overall pattern of Shakespeare's play, depicting Henry's campaign in France, through the siege of Harfleur. The film then shows the Battle of Agincourt in a real setting, after which the film quickly begins to revert to backdrops that are once again more and more like medieval illuminated manuscripts. We then see the negotiations for Treaty of Troyes and Henry's courtship of Princess Katherine followed by their marriage. At the end of the scene, the setting reverts to the Globe Playhouse and the audience applauding. The film won Olivier an Academy Honorary Award for "his Outstanding achievement as actor, producer and director in bringing Henry V to the screen." British director Alfred Hitchcock has released two short films this year. Alfred Hitchcock is now currently under contract to David O. Selznick at Twentieth Century-Fox where he has filmed Lifeboat. Hitchcock. Malagasy Adventure is a short film set in Madagascar where a young lawyer on holiday stumbles upon a spy ring and exposes it to the authorities. Bon Voyage is a short film depicting the escape of a downed Royal Flying Corps air gunner through German-occupied territory in 1917. It is interesting for its use of multiple viewpoints of the same events. British ukulele and comedy actor stalwart, George Formby, stars in two films this year. The first Bell-Bottom George, directed by Marcel Varnel stars George Formby and Anne Firth. Formby plays a Naval Association Club steward whose friend, a sailor and boxer, steals his suit and gets knocked unconscious. Formby is forced to put on the uniform as his other suit is still at the laundry and he mistaken gets arrested by a shore patrol and he finds himself in a naval barracks. Many songs ensue as he gets entangled with foreign spies trying to sink a secret anti-submarine vessel, falling in love with an Admirals daughter in the process. Together they expose the spy ring and Formby gets the girl and his suit back! He Snoops to Conquer is another comedy, also directed by Marcel Varnel. It also stars Robertson Hare, Elizabeth Allan and Claude Bailey. The plot involves an odd job man, Formby, who becomes mixed up in corruption in local politics and town planning. The title is a paronomasia of the famous comedic play, She Stoops to Conquer. James Mason has also starred in three films this year. Candlelight in Algeria is a romance directed by George King and starring James Mason, Carla Lehmann and Raymond Lovell. Fanny by Gaslight (released in the US as Man of Evil) is a period-set drama produced by Gainsborough Pictures. The film is set in the 1870s and is adapted from a novel by Michael Sadleir. Fanny (Phyllis Calvert) finishes at boarding school in 1880 and returns to London, where she witnesses Lord Manderstoke (James Mason) fight and kill her supposed father. She soon learns that her family has run a brothel next door to her home and on her mother's death also learns that the man see saw murdered was not her real father. She goes to meet her real father, a respected politician, and falls in love with his advisor, Harry Somerford (Stewart Granger). Lord Manderstoke, however, continues to thwart her happiness. Hotel Reserve stars James Mason as an innocent man caught up in espionage and is based on Eric Ambler's novel Epitaph for a Spy. Unusually, it was both directed and produced by a trio; Lance Comfort, Mutz Greenbaum (credited as Max Greene) and Victor Hanbury. The story is set in 1938 and follows Peter Vadassy (James Mason) who decides to take a vacation at the Hotel Reserve to celebrate both his completion of medical school and his impending French citizenship. When he goes to pick up some photographs at the local pharmacy, he is taken away and questioned by Michel Beghin (Julien Mitchell) of French naval intelligence. When his negatives had been developed, some of them turn out to be of French military installations. It is discovered that while the camera is the same make as Peter's, the serial number is different. Peter is released on condition that he finds out which other hotel guests have cameras like his. Peter does some snooping and eavesdrops on a suspicious conversation between Paul Heimberger (Frederick Valk) and the hotel's proprietor, Madame Suzanne Koch (Lucie Mannheim). He searches Heimberger's room and finds several passports, all with different names and nationalities. Heimberger catches him in the act and explains that he was originally an Austro-Hungarian newspaper publisher who emigrated when Germany took over Austria. Peter spots his camera in the pocket of a dressing-gown belonging to Odette Roux (Patricia Medina) and Andre (Herbert Lom), a couple on their honeymoon. Andre first tries to bribe Peter into giving him the negative and, when that fails, threatens him with a pistol. The police arrive at that moment and arrest Peter for espionage. The Rouxs leave the hotel, but find Heimberger tries to stop them. Andre shoots him and the couple speed off to Toulon, unaware that they are being tracked by the police. Beghin had known the identity of the spies all along and merely used Peter to further his true goal; to find out who the Rouxs are reporting to. The spy ring is captured. Andre attempts to get away but is caught on a roof by Peter. Andre slips and falls to his death. This year a film adaptation of Noël Cowards 1939 play This Happy Breed has been released. It was directed by David Lean and stars Robert Newton, Celia Johnson, Stanley Holloway and John Mills. The title of the play and the film is a reference to the English people, a phrase from John of Gaunt's monologue in Act II, Scene 1 of William Shakespeare's Richard II. The story concerns the working class Gibbons family after the end of the Great War. It examines the ways in which social justice issues were incorporated into post-war national reconstruction, the personal trauma caused by the sudden death of loved ones is an intimate portrait of the economy and politics of Britain in the 1920s and 30s. This Happy Breed is one of few Coward plays to deal entirely with domestic events outside an upper class or upper middle class setting. The acclaimed director Carol Reed has released a film this year which was written by Eric Ambler and Peter Ustinov. The Way Ahead is a war drama released starring David Niven, Stanley Holloway, John Laurie, Raymond Huntley and Peter Ustinov. The film follows a group of civilians who join the British Army in 1916. Lieutenant Jim Perry (David Niven), a veteran of the British Expeditionary Force, is posted to the Duke of Glendon's Light Infantry to train replacements to fill its depleted ranks. A patient, mild-mannered officer, he does his strenuous best to turn the bunch of grumbling ex-civilians into soldiers, earning himself their intense dislike. Eventually however, the men come to respect their officer. After their training is completed, their battalion is shipped out the Middle East. However, their ship is torpedoed en route, and they miss the fighting. They are assigned to guard a small Lebanese town. Perry appropriates a cafe as his headquarters, much to the disgust of the pacifist owner, Rispoli (Peter Ustinov). When the Turkish attack, Perry and his men fiercely defend their positions, aided by Rispoli. The last scene shows them advancing in a counter-attack with bayonets fixed. The film-making team of Michael Powell and Emeric Pressburger have released a new film and their second collaboration with cinematographer Erwin Hillier. A Canterbury Tale stars Eric Portman, Sheila Sim, Dennis Price and Esmond Knight provides narration and plays several small roles. The film takes its title from The Canterbury Tales of Geoffrey Chaucer, and loosely uses Chaucer's theme of eccentric characters on a religious pilgrimage. The story concerns three young people; a British Army Sergeant Peter Gibbs (Dennis Price), an American tourist Bob Johnson (John Sweet) and a young woman, Miss Alison Smith (Sheila Sim). The group arrive at the railway station in the fictitious small Kent town of Chillingbourne, near Canterbury, late at night on a Friday. As they leave the station together Alison is attacked by a mysterious assailant who pours glue on her hair, before escaping. It transpires that this has happened quite a few times before. Alison asks Bob if he could spend the weekend in Chillingbourne to help her solve the mystery. The next day, while riding a farm cart in the countryside, Alison meets Peter, who surrounds her cart with his platoon and they agree to meet again. The three decide to investigate the attack, enlisting the help of the locals, including several young boys. The three use their detective skills to identify the culprit as a local magistrate, Mr Thomas Colpeper (Eric Portman), a gentleman farmer and pillar of the community, who also gives local history lectures. On a train journey to Canterbury on the Monday morning, Colpeper joins them in their compartment and they confront him with their suspicions, which he doesn't deny, and they discover that his motive is to keep the local women faithful from the distractions of the local soldiers. In Colpeper's words, Chaucer's pilgrims travelled to Canterbury to "receive a blessing, or to do penance". On arriving in the city of Canterbury all three receive blessings of their own. Alison discovers that her boyfriends father, who had blocked their marriage because he thought his son could do better than a shopgirl, has finally relented. Bob discovers long-lost British relations and Peter, previously a cinema organist, gets to play the music of J.S. Bach on the large organ at Canterbury Cathedral. He decides not to report Mr Colpeper to the Canterbury police, as he had planned to do  in its way a blessing for Colpeper, when he had expected instead to do penance. Ealing Studios have released a musical this year. Champagne Charlie is based on a play that depicted the real life rivalry between George Leybourne, who first performed the song of that name, and Alfred Vance. The film, directed by Alberto Cavalcanti, centres around Leybourne and Vance who were popular Music hall performers of the Victorian era described as lion comiques, who were 'top of the bill' at their respective music halls; Laybourne at the fictional Mogador (based on the Théâtre Mogador in Paris) and the other, the real Oxford Music Hall. Leybourne is played by Tommy Trinder and Vance by Stanley Holloway. The female leads are Betty Warren and Jean Kent. The film opens with a sing-song in a public house in Elephant and Castle and follows the rise of Leybourne in the music hall. The highlight of the film is a competition between the two protagonists. Trinder sings "Ale Old Ale", Holloway replies with "Gin, Gin, Gin", continuing, with the scene finally ending with the song of the title. The film is notable for its verity approach to showing details of the audiences, venues and staff; with copious quantities of food and drink forming a vicarious delight for the audience. Tommy Trinder also appears in another musical comedy this year, Fiddlers Three produced by Michael Balcon and directed by Harry Watt. The cast also includes Sonnie Hale, Frances Day, Francis L. Sullivan, Diana Decker, Elisabeth Welch and James Robertson Justice. It follows the adventures of three travellers who are struck by lightning and transported back to Ancient Rome, where they are accepted as seers. The film was released in the US as While Nero Fiddled. It is a loose sequel to the 1940 film Sailors Three which had also starred Trinder. The film was only moderately successful at the British Box Office but proved to be a major hit in Australia. Another Ealing Studios film, For Those in Peril marks the directorial debut of Charles Crichton and he has produced a film with a documentary feel. The film is adapted from a short story by Richard Hillary. The story sees an aspiring RAF pilot Rawlings (Ralph Michael) failing to make the grade in training, and begrudgingly accepts the alternative of joining the crew of an air-sea rescue craft skippered by Murray (David Farrar). Rawlings is initially resentful and bored by the lack of excitement. Then the vessel is called on to rescue the crew of an RAF transport which has crashed into the Channel while carrying several VIPs. Having accomplished the rescue, the boat runs into a storm, Murray is incapacitated and Rawlings must take charge and bring the vessel safely back to shore. Director Val Guest has filmed two films this year. Bees in Paradise is a musical comedy film starring Arthur Askey, Anne Shelton and Peter Graves. It was produced by Edward Black at Gainsborough Pictures. The film is set on a mysterious island where scantily clad warrior women hold all the power and men are regarded as disposable beings useful only for breeding purposes. Comic scenes result when four airmen arrive on the island and become the object of native womenfolk's desires. Give Us the Moon is another comedy starring Vic Oliver, Margaret Lockwood and Peter Graves. The plot revolves around a young layabout son of a hotel owner becomes involved with a group equally committed to doing no work and tries to join. On Approval is a comedy film directed by Clive Brook and starring Beatrice Lillie, Clive Brook and Googie Withers. It is based on the play On Approval by Frederick Lonsdale. Clive Brook took this popular play, originally set in the early 1920s and transposes it to the late Victorian era, where the concept would have been much more shocking. Brook wrote the screenplay and produced and directed the film. It is one of the very few films starring Beatrice Lillie, often referred to as "The funniest women in the world" for her eccentric personality and portrayal of so many amusing stage plays and revues. The film begins with an amusing documentary-style prologue about contemporary life in England, which serves as introduce Brook's character, George in the late Victorian era. George is the 10th Duke of Bristol. He is haughty, irascible and with a very dry sense of humour. He is also nearly broke. His friend, Richard, is in love with widowed Maria, but since he too is poor, he hasn't the nerve to propose to Maria. Helen is a wealthy American, due to her father's successful business and is in love with George. What follows is a witty and very funny series of events which cause all four to be stuck together at Maria's Scottish island home. How can two nice and two difficult personalities survive together in an isolated island estate? Don't Take It to Heart is a comedy film directed by Jeffrey Dell and starring Richard Greene, Alfred Drayton, Moore Marriott and Patricia Medina. Its plot involves an ancient ghost that is awakened and who helps a young lawyer to win his case. Dreaming is a comedy film directed by John Baxter and starring Bud Flanagan, Chesney Allen and Hazel Court. Its plot concerns a boxer who is knocked unconscious during a bout and has a series of bizarre dreams. English Without Tears is a comedy film directed by Harold French and starring Michael Wilding, Penelope Dudley-Ward and Lilli Palmer. The plot involves the niece of an aristocrat who falls in love with the butler. It's in the Bag is a comedy film directed by Herbert Mason and made by Butcher's Films. It stars Elsie Waters, Doris Waters and Ernest Butcher. The plot sees Gert and Dasie trying to recover a valuable lost dress. It Happened One Sunday is a romantic comedy film directed by Karel Lamac and starring Robert Beatty, Barbara White, Marjorie Rhodes, Kathleen Harrison and Moore Marriott. The story is about an Irish servant girl working in Liverpool who mistakenly believes she has a secret admirer working at a hospital, and while seeking him out accidentally meets and falls in love with someone else. She spends the rest of the day around Liverpool with him and they eventually decide to marry. The film is based on the play She Met Him One Sunday by Victor Skutezky. Love Story is a romance film directed by Leslie Arliss and starring Margaret Lockwood, Stewart Granger and Patricia Roc. It is based on a short story by J.W. Drawbell. A concert pianist, upon discovering she is dying of heart failure, decides to see out her days in Cornwall. While there, she meets an ex-pilot who is going blind and romantic tensions form. Medal for the General is a comedy film directed by Maurice Elvey. The screenplay by Elizabeth Baron is based on the novel of the same title by James Ronald. The title character is Victor Church, a Great War veteran who becomes despondent when his advancing age prevents him from playing an active role in life. Feeling unwanted and useless, he retreats to his country estate and plans his suicide. He finds a new purpose in life when he opens his home to six rambunctious orphaned Cockney children and tries to keep the mischievous group under control. Times Flies is a comedy film directed by Walter Forde and starring Tommy Handley, Evelyn Dall, Felix Aylmer and Moore Marriott. The plot sees a music hall performer traveling back to Elizabethan times using a time machine. One Exciting Night is a musical comedy film directed by Walter Forde and starring Vera Lynn, Donald Stewart and Mary Clare. The plot sees a female singer becoming involved with a man who is the victim of a kidnap plot. Heaven is Round the Corner is a musical directed by McClean Rogers starring Will Fyffe, Leni Lynn, Leslie Perrins and Austin Trevor. A country girl goes to Paris to sing professionally, where she falls in love with a member of the British Embassy. They are parted by subsequent events but are eventually reunited again. The Halfway House is a drama directed by Basil Dearden and starring Tom Walls, Mervyn Johns and Glynis Johns. It also features the French actress Françoise Rosay. It tells the story of ten people who are drawn to stay in an old hotel in a remote Welsh village. Welcome, Mr. Washington is drama film directed by Leslie S. Hiscott and starring Barbara Mullen, Donald Stewart, Peggy Cummins, Martita Hunt and Herbert Lomas. The film sees two sisters who are left almost penniless by their father's sudden death and who are forced to lease their estate for the sire of a factory to a newly arrived American industrialist. Headline is a thriller film directed by John Harlow and starring David Farrar, Anne Crawford, William Hartnell and John Stuart. It is based on the novel The Reporter by Ken Attiwall. Its plot involves a crime reporter who searches for a mystery woman who has witnessed a murder. The Hundred Pound Window is a crime film directed by Brian Desmond Hurst and starring Anne Crawford, David Farrar, Frederick Leister and Richard Attenborough. The plot sees an accountant who has to take a second job working at a racetrack where he soon becomes mixed up with a shady crowd. Tawny Pipit is a film produced by Prestige Productions. It tells of how a sleepy English village becomes the centre of attention when a rare bird's nest is discovered there. The story sees Jimmy Bancroft (Niall MacGinnis) and his girlfriend Hazel Broome (Rosamund John) on a walking tour through the countryside. They arrive at the fictional village of Lipsbury Lea and being keen birdwatchers, discover that a pair of tawny pipits, which are rarely seen in England, are nesting nearby. Staying in the village, they enlist the locals to protect the nesting site until the eggs hatch. The villagers do so with great enthusiasm, led by the fiery retired Colonel Barton-Barrington (Bernard Miles) and the Reverend Mr. Kingsley. Unfortunately, the field where the nest is located is due to be ploughed up by order of the county agricultural committee and a delegation to the Ministry of Agriculture in London fails to get the order rescinded. Fortunately, the Minister was Barton-Barrington's junior at school, and personally intervenes to save the field from being ploughed. The eggs duly hatch, but not before a plot to steal the eggs on behalf of an unscrupulous dealer is foiled by an alert amateur ornithologist. The Camberwell North by-election was held on 31 March for the constituency of Camberwell North. The by-election was triggered by the elevation to the peerage of the town's Labour Member of Parliament, Charles Ammon, who was ennobled as Baron Ammon. The Labour candidate was Cecil Manning. The result was one of the lowest turnouts in a by-election on record. While the number of available electors was estimated at around 8,000, Manning was elected with just 2,655 votes, a majority of just 1,981. The by-election for the constituency of Bilston was held on 20 September, caused by the death of the incumbent Conservative MP, Ian Hannah. The result was a hold for the Conservative Party, with their candidate William Ernest Gibbons with a majority of just 349 votes over the Labour Party candidate. The Chelsea by-election, 1944 was held on 11 October for the constituency of Chelsea in London. The by-election was caused by the elevation of the constituency's Conservative Party Member of Parliament, Sir Samuel Hoare, to the peerage as Viscount Templewood. Hoare had held the seat since the 1910 general election. The Conservative candidate, William Sidney, was returned in a comfortable Conservative hold. General elections were held in Jamaica on 12 December 1944. The result was a victory for the Jamaica Labour Party, which won 22 of the 32 seats (41.4% of the vote). Voter turnout was 58.7%. The Peoples National Party won 5 seats (23.5% of the vote) as did five independent candidates (30% of the vote). The Jamaica Democratic Party and other smaller parties won no seats. A political party was founded in Britain this year, the Revolutionary Marxist Party. The party also publishes the newspaper Socialist Appeal and the theoretical journal Workers International News. The party was founded as the official section of the Fourth International in Britain after the collapse of the Revolutionary Socialist League. The League had been against the Workers International League, whose position corresponded to that of the Fourth International and the American SWP. As a result the latter decided that the Workers International League should become the International's British section. In order achieve this, the Americans exerted pressure to re-unite three factions of the Revolutionary Socialist League. This group became the Revolutionary Marxist Party led by Jock Haston. The leadership also incorporates former Revolutionary Socialist League leaders such as Denzil Dean Harber and John Lawrence. The new party maintains an entrist faction in the Labour Party led by Charlie van Gelderen and which maintains the publication of The Militant  as its organ. The main area on which the party concentrates is industry. Recruits have come from direct intervention in industrial struggles such as that of the Kent miners and the Tyneside engineering apprentices. This latter dispute led to the police raiding their London headquarters and a number of leading members were subsequently jailed. The party is yet to stand a Parliamentary candidate. National Council of Nigeria has been formed by Dr. Nnamdi Azikiwe and Herbert Macaulay. Herbert Macaulay has become the party's president, with Azikiwe as its secretary. The party is made up of a large group of nationalist parties, cultural associations, and labour movements. The party is the second to make a concerted effort to create a true nationalist party. It embraces several different sets of religious, tribal and trade groups. Notable exceptions include the Egbe Omo Oduduwa and the Nigerian Union of Teachers. The party is considered to be the third prominent political party after the Nigerian National Democratic Party and the Nigerian Youth Movement. The BBC World Service French language programme has now started broadcasting from N'djamena to serve the population of Chad and the French speaking people of central Africa. The Colonial Development Office has begun publicly outlining their plans for Chad. The most expensive plan in the integration of Chad into the railway system in Africa. The first phase will be to link the current East African Railways link from Nyala in Anglo-Egyptian Sudan to Ndjamena crossing around 500 miles of desert. Phase two will be to make a connection from the West by extending the railway line from Maiduguri in north-eastern Nigeria to Ndjamena, a distance of around 150 miles. Other plans include four agricultural schemes, three housing schemes and some industrial expansion plans. Around £6 million has been approved for spending plans this year with private industry being given the fullest opportunity to contribute. Today marks the first day of the PAYE (Pay as you earn) system of tax collection introduced by the Treasury. The PAYE scheme was devised by Sir Paul Chambers and was trialled in several localities during 1940-1941. The new scheme is designed to streamline the tax system with a more efficient method of collection as well as raising tax revenues by taxing many workers and employers who had previously never come into contact with the tax system. Two men in dark suits are walking in one of London's parks. They blend into the background during the busy lunchtime break and damp blustery weather typical of the time of year. "That German matter your department raised a while back. What was the outcome?" "Oh nothing much, we haven't heard any more about it." "No loose ends?" "No I don't think so. The chap was killed in a road accident, nothing else seems to have happened." "Good. I hope the luncheon at your club is good..."
Another flotilla of destroyers has been decommissioned today, the second of the refitted V&W Class destroyer flotillas which had been used as Anti-Aircraft destroyers. The 2nd Destroyer Flotilla at Cromarty disbanded and HMS Vansittart, Venomous, Verity, Veteran, Vimy, Volunteer, Wanderer and Whitehall decommissioned. The BBC today started a new radio station, the General Forces Programme. This is a worldwide transmitted service to provide educational and entertainment programming for members of the British and Commonwealth armed forces. The programmes are a mixture of drama, comedy, popular music, features, quiz shows and variety was richer and lengthy news bulletins and informational programmes and talk. Programmes include; Shipmates Ashore for Navy and Merchant Navy sailors, Navy Mixture for the Royal Navy, Forces' Favourites a record request show, War Office Calling the Army providing information and news, Strike A Home Note for Scottish servicemen overseas, Welsh Half Hour for Welsh servicemen overseas and weekly comedy show Mediterranean Merry Go Round made up of Stand Easy for the Army, Much Binding in the Marsh for the RAF and HMS Waterlogged for the Navy. Canadian Broadcasting Corporation programmes are also transmitted. In 1938 the BBC merged the existing BBC National Programme and BBC Regional Programme to form the BBC Home Service. Introduced in 1940 was the BBC Light Programme for listeners in Britain. Around this time the BBC Empire Service was renamed the BBC General Overseas Service. The Rural Water Supplies and Sewerage Act 1944 was passed in Parliament today. It empowers the Government to make grants for the purpose of expanding rural water supplies, up to the sum of £15,000,000 in England and Wales and £6,375,000 in Scotland. The Ministry of Education has issued a new set of teaching standards and has lifted the prohibition on married women working as teachers. Mr George Miles took the controls of his companys latest design today, the Miles M.57 Aerovan. It has been designed as a private-venture small cargo carrying aircraft. It has a pod and boom configuration, a pilot and six passengers can be carried as an alternative to 2,240lbs of cargo. Clamshell doors are fitted aft and it is powered by two 150hp Blackburn Cirrus Major engines. Maximum speed is 160mph and range 450 miles. Archaeological excavation work has begun on the so-called 'Caesar's Camp' which is located on the site of the new London Heathrow Airport. Some archaeologists believe the site may possibly be pre-Roman. The Mosquito was flying at 20,000 feet over the Irish Sea; he could see Anglesey off to port. Flt. Lt. Terrence Harrows earphones crackled, "
Sparrow to Kennel. We have your track, you are in the firing area. The target is at Angels Ten speed three-oh-five heading three-four-two. There are no other contacts in your area. You are authorised to release the Spaniel." " Harrow turned to his navigator, "Well here we go again. Power on?" "Power on. Scope operating ok. I've got the target about two thousand five hundred ahead.
" Terrence could see the yellow Spitfire below. He lowered the nose a little to lose a little height and then he flicked off the safety switch on the control panel and flicked his gun button guard. He pressed his microphone, "Kennel to Sparrow. Releasing Spaniel." As he clicked off he pressed the button with his thumb. There was no noise or recoil as the rocket streaked off the starboard wing. The navigator had hes head in the scope, his left hand gripping a small control stick. " " Terrence kept the aircraft still to ensure the RDF scanner was not upset. He could trace the smoky trail of the rocket, suddenly it went left and began to climb. "Christ its another runaway!
" and jerked his head out of the scope and saw the trail rising before it stopped as it ran out of cordite and began dropping. Terrence altered course to avoid the Spitfire. Half a minute later the rocket impacted on the waves. Terrence shook his head as he radioed home, "This is Kennel to Sparrow. Another rogue Spaniel. Splashdown in the sea. Returning to base.
" The Spitfire would live for another day. The Admiralty confirmed today that the Admiral Class battleship HMS Jellicoe now under construction has been renamed HMS Pound to honour the recently deceased First Sea Lord who had begun the Admiral battleship programme. Firm specialising in constructing tailless sailplanes and motorised gliders. It was a very short entry with a couple of photographs and details about their gliders but he noted that both brothers, Walter and Reimar, had been invited to the Harrogate Conference on flying-wing aircraft in 1941 but declined. Was that because they were undertaking top secret development work? Wood could see the similarity between Hortens gliders and the machine now before him on the plans. He was satisfied that the design was from Horten and that they could design such an aircraft. But would it fly? Could it realistically fly at 1000 km/h carrying a 1000 kg payload over 1000 km? It was a big jump for such a small firm to develop a jet-powered aircraft of this magnitude and therefore Focke Wulfs involvement was vital. Sure, carrying 2,200lbs of bombs over 620 miles was no problem, he knew the Mosquito could double that performance, but a bomber or a fighter capable of 620mph meant a whole new defence problem. He examined the plans closely with a magnifying viewfinder and pawed over the details. Helpfully the plan has full dimensional data and offered a detailed look at the major systems inside. Whoever had copied this plan had chosen it extremely carefully he thought. He looked up and opened the thick file on British research into tailless aircraft. The biggest such flying wings under study in Britain were the work of John Lloyd, Armstrong Whitworth's Chief Designer. These were laminar-flow wings. His proposed trans-Atlantic flying wing was far larger than the Horten design. He examined the brief report on the AW.52G scale glider which began flying in late 1941 and had proved successful. Lloyds preferred control system was endplate fins and rudders, a Fowler flap along the centre-section trailing-edge and elevons with 'corrector surfaces' ahead of the elevons to maintain trim when the flaps are lowered. Handley Page was working on experimental tailless jet-powered heavy bombers with all-up weights of 40-50,000lbs based on the HP.75 Manx scale prototype, more than double the weight of the German design. He noticed the Horten design had elevons and correctors too and the 28 degree wing sweep was more conservative than the A.W.52Gs 34 degrees. This made him feel more sure that it would be controllable but of course no-one had flown such aircraft at high speeds and there was no telling what might happen with compressibility effects although it looked feasible that the sweepback would raise the critical Mach enough to be useful. Even so there was a massive difference between cruising in straight lines over the Atlantic or on high-altitude bombing runs, this was a fighter-bomber and would have to operate well at all altitudes and be capable of fighter manoeuvres. Could any current control system allow that kind of manoeuvrability and stability without tail surfaces? As he went back to the plans his trained eye noticed too odd things, the fuselage was mainly steel tubing but seemed not to be a metal monocoque and he wondered if the Hortens had retained plywood construction. That would be unusual but logical. Also he noticed no bomb-bay. Two 500kg or a single 1000kg bomb would have to be recessed somewhere but the engines and nosewheel took most of the internal volume. External carriage would reduce the speed. Could the available jet engines reach such speeds? Wood felt sure the engines would be the latest Junkers Jumo-004s and would have enough thrust to equal speeds the Meteor was achieving, but he had no way to accurately calculate whether the low drag would offset the lower thrust. Wood began to type his recommendation that the RAE build some models based off the plans and test them in their high-speed tunnels. Bringing the NPL in might be advisable but security was vital. He also typed out a recommendation that Lloyd be shown the results and the plans but not Handley Page. Dr. Gustav Lachmann was an authority on such designs but he was a German and if he got wind of this it might leak back. As it was the source wasnt known even to Wood. You mean HMS Beatty is renamed HMS Pound, right? Not HMS Jellicoe? Perhaps the British should just build a HMS Pound. The Spaniel in question is not the historical Spaniel surface to air guided weapon is it? It sounds as if an air-to-air weapon is being described. In either case I am surprised that they are in test so early. Brock, there is no HMS Beatty, that name was mooted in the pre-laying down stages but was replaced by HMS Jellicoe. Pound wasn't a great wartime Admiral but it avoids the old boys stirring up the whole Jutland issue. In 1939 the Senior Scientific Officer at what became the Radar Research Establishment, W.A.S Buteman, proposed a radar-guided anti-aircraft projectile (GAP) which became the OTL RDF Spaniel based on a 3in rocket with trials between 1941-43. These all match OTL dates. The RDF Spaniel was a beam-rider. I've not touched the PE Spaniel with photo-electric cell. Development proved abortive due to technical issues and the puny 3in rocket but it was developed during 1943 into the Fighter-Controlled Spaniel. A 3in rocket fitted with lifting surfaces and command guidance via radio link and controlled by the radar operator via CRT and joystick. It has a 3,000 yards range (flight distance, actually launched when target 2,000 yards away) and speed of 784mph speed. Trials have only recently begun and will be abandoned later in 1944. Control issues and radio link failures are the main problems. The flight time of 6 seconds is too short to make any adjustments and the first 2 secs are unguided. Also, the 3in is still too puny for air-air work. None of this is service weaponry, its all boffins messing around at this stage. Fairly cheap tinkering to see if an 3in RP can be made more accurate. You might want to update the encyclopedia post, then - it still lists the HMS Beatty as one member of the class. 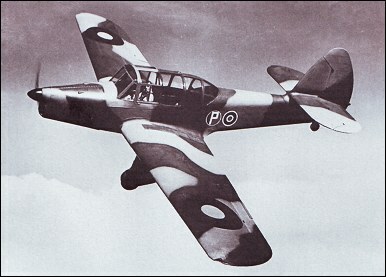 First flight of the Percival Prentice trainer prototype, TV163. The Prentice has been designed to replace the Tiger Moth to meet Spec T.23/41. The RAF may order almost 400 production trainers if testing and trials go according to plan and deliveries could begin next year. Reports came through today that huge reserves of gold have been found near Tamworth worth billions of pounds. In other news the King has stepped down in favour of a claim on the throne by Reggie Smith, a docker from Canvey Island and the Royal Navy is to sell all its aircraft carriers for £10 million each. HMS Hood arrives in Alexandria, Egypt on the next leg of her eastbound Empire tour. From tomorrow several cultural exhibitions will be open to the public on her quarterdeck. Several notable government and industrial figures left for meetings with the Egyptian government in Cairo. The government-funded Council for the Encouragement of Music and the Arts today launched their cultural activities programme across Britain and the Empire to coincide with the 1944 Empire Exhibition. Around 480 events will be held between now and November across the world. Harry had been worried. He knew TEAPOT had always been regular. He was aware that things had not been going well and now his latest letter was overdue. He had hurried to the safe house just off the East India Dock Road. Inside his section head was already there. "Hullo Harry. Why the crash meeting? What's happened?" "The regular letter is overdue, we've had nothing from Messmer for the past few days. That's most irregular given he was like clockwork." "Nothing at all?" "Nothing. I think the worst has happened." "I see. Well there's not much we can do about it now. Don't send anything but the usual business letters, no secret inks or messages. If they stop paying the bills act natural like any businessman, send the usual demands etcetera. Then we'll cut the association with the firm. I want all the material safely in the key archive on the fifth floor. Everything Harry. Don't leave any loose ends." "I understand Sir." Control was under a cloud of cigar smoke. He looked tired and was his usual sharp self. "Damn network finally gone dead?" "Yes Control. It seems communications have been severed. We'll play along for a bit before cutting our lines." "Well don't send any damned couriers. The case is extremely hot and I want it tied with lace ribbons. Understand." "Yes Sir." "Good. Now, Kraft and his network are probably in custody as we speak. They'll sing to save their necks. It's a shame we couldn't have gotten some of them out before this. You told me things were quiet!" "Well they seemed so. Kraft said nothing to indicate he couldn't get the milk back into the bottle." "Indeed. The German's are going to make a public stink over this. We've got to ready our denials. How much could they know from what Kraft has to link them to us with evidence?" "Only codes, we've sent him no equipment, only the odd piece of photographic equipment, all brought on the continent. The money was genuine Marks." "Hmmm, so. Well you can go now. I want a full report by the end of the week." Control's mind was sharp, as he puffed on his cigar he got up and surveyed the street below. If the Germans had no evidence he knew they couldn't make it stick, and he knew that if the German's had any proof there was a mole somewhere. He assessed the likelihood that the Abwehr had made a lucky break and swept up all the network in one swoop as being small. To link all the pieces required information, someone had talked, probably more than one person. David Petrie would have to be brought into the secret. The aircraft company of Fairey Aviation Limited and Rolls-Royce Limited have today announced big orders from Greece. Greece has ordered thirty-six new Fairey Firefly Mk.III fighters and engines and equipment to retrofit the hundred Fireflies currently in Greek service to Mk.III standard. The new Mk.III is fitted with a 2,420hp Rolls-Royce Griffon III V-12 engine for a maximum speed of 405mph. Also on order are thirty-six Barracuda Mk.II torpedo-bombers and retrofit kits and Rolls-Royce engines to bring all forty-eight current Barracudas to the same standard. The conversions of the existing Firefly and Barracuda airframes will be undertaken by the Greek company KEA. The Medical Research Council Applied Psychology Unit has been opened today at Cambridge University. It has been created to aid the development of psychological theory and practice. The Director is Kenneth Craik, a philosopher and psychologist who studied philosophy at the University of Edinburgh and received his doctorate from Cambridge University in 1940. He received a fellowship to St John's College, Cambridge in 1941. In 1943 he wrote 'The Nature of Explanation' in which he laid the foundation for the concept of mental models, that the mind forms models of reality and uses them to predict similar future events. He is one of the earliest practitioners of cognitive science. The Westland Aircraft Company Limited publicly announced today that they were merging with the Bristol Vickers Aircraft Company (BCAC). Firth-Brown Steels and Vickers-Armstrong are also preparing a series of shares deals. The BCAC will become the British Combined Aircraft Corporation in order to maintain its acronym. Petters Ltd., the founders of Westland in 1915, will receive a 10% share in BCAC. Westlands joint company, Normalair Ltd., with General Aircraft will be maintained as a separate company. In the City today speculation following this announcement was rife. Among the rumours was a possible merger of the Vickers and Brown empires which would see John Brown & Co. shipyards, Firth Brown Steels and Coventry Ordnance Works combining with the Vickers-Armstrong empire of shipbuilders and armament manufacturers to create a powerful industrial conglomerate. After leaving Alexandria yesterday and heading through the Suez Canal HMS Hood has arrived in Port Sudan, Sudan on the next leg of her world tour.